Damiana is a plant that grows well in the hot, humid climate in Baja California, Mexico. Several Mexican producers use the plant to make damiana liquor, a sweet, herbal alcoholic beverage that is rumored to be a strong aphrodisiac. Damiana liquor can be consumed on its own or used as an ingredient in a variety of mixed drinks. The leaves from the damiana plant were traditionally used in Mexico for medicinal purposes to treat a range of ailments including asthma, headaches and depression. Damiana liquor was first made by the Guaycura Indians in Mexico and used during religious ceremonies. According to ancient legend, damiana liquor was eventually banned by the Guayacara due to its strong aphrodisiac powers. 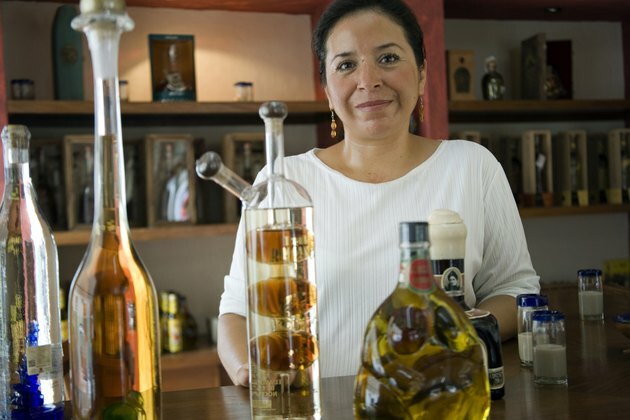 In some parts of Mexico, a wedding tradition includes giving a new bride a bottle of damiana liquor as a gift to encourage fertility. Damiana liquor has a sweet, herbaceous flavor. The light taste reflects the subtle herb notes of the damiana plant. Some brands of damiana liquor are sweeter than others. Small batch producers tend to make damiana liquor that is less sweet and has more of the original damiana flavor, which tastes mellow and woody. To make damiana liquor, producers gather the leaves and stems of damiana plants while the plants are flowering. The leaves and stems are dried and combined with alcohol to infuse the liquor with damiana flavor. Many people drink damiana liquor straight as an after-dinner drink. Some people enjoy using damiana liquor to make margaritas. A damiana margarita is made with tequila, fresh lime juice, and damiana liquor shaken in a drink mixer with plenty of ice. Damiana liquor can be used in many drink recipes to replace orange-flavored liquor. According to "The American Materia Medica" published in 1919, damiana has a history of being widely recognized as a cure for sexual impotence in Mexico and throughout the U.S. For that reason, the largest producer of damiana liquor markets the beverage in glass bottles in the shape of naked pregnant women, similar to familiar fertility goddess sculptures.